This is a little gem of bartending support. 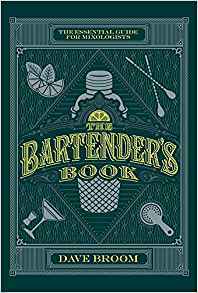 The Bartender’s Book, or to give it its full and impressive title The Bartender’s Book: The Essential Guide for Mixologists, by Dave Broom, is something of a barman’s/woman’s almanac. The cover gives a sense of the early 20th century, when cocktails became fashionable. The book offers excellent and practical advice for professional bartenders but also for those who want to mix quality cocktails at home. You will doubtless have noticed that a brace of mixed drinks in a smart bar, hotel or restaurant will likely set back the sipper a good £20 or £30. One can buy a whole bottle of spirits for the same price. The Bartender’s Book gives instructions on how to set up the home bar. It offers a considerable list of spirits to have on hand, but you could just start with the more common ones and add to them as time goes by; but do remember that spirits, just like wine, lose their freshness once opened. The cocktails section provides all the recipes, and there are more than 500 of them. They are in alphabetical order here, but the back of the book holds an index of drinks by prominent spirit. That is particularly important when a guest only drinks vodka as gin makes him/her morbid. One can be prepared for any alcoholic fetish. The array of cocktails listed is comprehensive and covers classics such as the simple and crisp Dry Martini of Dry Gin, Noilly Prat and a twist of lemon to the more flamboyant Tomahawk with its combination of Tequila and Triple Sec, Cranberry Juice and Pineapple Juice. Some cocktails have just a couple of ingredients and others might have to wait till your spirit stock has increased. Cocktails combine theatre and anticipation. Ingredients can be shaken with a flourish or stirred stylishly. They can be bright, colourful and exotic and offer memories of that last vacation, or they can be short and sophisticated. The Bartender’s Book: The Essential Guide for Mixologists is a great introduction to these drinks that can, when made well, be so delicious and well-balanced.